Internal resorption is a rare lesion in permanent teeth. Managing perforating internal resorption is a great challenge for dentists. This report presents a successful surgical treatment of a maxillary central incisor that had extensive root perforation due to internal resorption. After unsuccessful nonsurgical approach, during surgical intervention apical part of the resorption defect was removed and the coronal part was filled with mineral trioxide aggregate. Three years later the tooth was symptom free with normal mobility and pocket depth despite unfavorable crown-to-root ratio. This case report have shown that surgical intervention and using mineral trioxide aggregate as root canal filling material in a tooth with extensive internal resorption and unfavorable crown-to-root ratio can be considered as a treatment option. Mineral trioxide aggregate (MTA) has been widely used as root-end filling material, pulp capping agent and perforation repair material. MTA is a material mainly consists of calcium, silica, and bismuth oxide. , Several case reports have used MTA for nonsurgical and surgical treatment of internal resorption with perforations in primary and permanent teeth. ,,,,, However, none of those case reports represented surgical intervention for treating internal resorption with unfavorable crown-to-root ratio. This report presents a case with a history of trauma and root perforation due to extensive internal resorption and very poor prognosis because of unfavorable crown-to-root ratio that successfully treated by a surgical intervention. A 22 year old female was admitted to the postgraduate endodontic clinic for treating her right maxillary central incisor (tooth No. 8). She had no remarkable medical history and her chief complaint was tooth mobility and yellowish discoloration in addition to the presence of a sinus tract above the tooth No.8 [Figure 1]a. Patient's past dental history illustrated that she had a complicated crown fracture 15 years ago which was treated by a general practitioner. Radiographic examination showed an extensive internal resorption defect and several swimming gutta-percha cones inside the root canal space [Figure 1]b. The results of sensibility tests (heat test, cold test, and electric pulp tester) were normal for all maxillary anterior teeth except for the tooth No.8 that was not responded to the tests. During dental examination grade II mobility and probing depth of 6 mm at the buccal aspect of the tooth as well as patient tenderness in percussion and palpation had been noticed. Based on radiographic size of the resorption and pocket depth the prognosis was considered very poor to hopeless. Other treatment options such as replacement of the tooth with a single tooth implant or fixed prosthetic restoration was recommended to the patient; however, she refused to accept those treatment options and insisted in retaining her tooth despite extremely poor prognosis. Therefore, after administrating 2% lidocaine with 1/80000 epinephrine (Darupakhsh, Tehran, Iran) as anesthetic solution, rubber dam was placed and a standard access cavity was prepared. The gutta-percha cones were removed and the root canal was instrumented and irrigated. Severe bleeding was encountered during gutta-perch removal; therefore, the root canal was dressed with a thick CH paste (Golchai, Tehran, Iran) for two weeks. At the second visit the bleeding was not stopped and surgical interventional was recommended for overcoming the bleeding. The patient was instructed to use 0.2% chlorhexidin mouth wash from 48 h before surgical intervention. A rectangular full mucoperiosteal flap was prepared. After raising the flap we have encountered no bone at the buccal aspect of the right maxillary incisor and the apical part of the root had no attachment to the rest of the tooth structure due to extensive internal resorption. Therefore, the apical part was removed [Figure 1]c and the coronal part of the tooth was filled with gray MTA (ProRoot MTA, Maillifere, Dentsply, Balligues, Switzerland) as root canal filling material through the access cavity [Figure 1]d. The coronal level of root filling was up to the cervical part of the tooth and a moist cotton pellet was placed over MTA before placing temporary restoration. Bone auto graft which was prepared from the wall of apical part of the tooth No.8 was used for periodontal regenerative process and placed over the buccal aspect of the root before suturing. Then the flap was sutured (4/0 Silk sutures, GC, Tehran, Iran) and the anterior teeth were splinted by wire composite resin for 2 weeks. Patient was prepared with conventional postsurgical instructions in addition to use soft diet during next couple of days after surgery. After 5 days the sutures were removed and the access cavity was restored with compost resin. Two weeks after surgery the splint was removed. Fourteen months later patient was completely symptom free with normal mobility as well as 2-3 mm gingival pocket depth at all aspects of the tooth and radiographic image showed favorable healing [Figure 2]a and b. Two years after surgical intervention, the esthetic was improved by providing a new composite resin restoration [Figure 2]c. Three years after treatment the patient has been still enjoying normal mobility [Figure 2]d.
This case report illustrates a successful treatment of root perforation due to extensive internal resorption by surgical intervention and use of MTA as root filling material. In a case series study, Caliskan and Turkun  have reported 3 out of 28 cases needed surgical intervention for treating internal resorption cases that did not respond to nonsurgical treatment. However, they did not use MTA as perforation repair material. It has been generally accepted that MTA has osteo-inductive and osteo-conductive ability. , Patel et al, in their review of literature recommended MTA as the material of choice for treating internal resorption in case of root perforation due to the pathologic process. In the present case, MTA was used as root canal filling material when we encountered the separation of apical part of the tooth from the coronal part during the surgery. The chance of re-mineralization in perforating internal resorption reported poor. Caliskan and Turkun  have believed that the presence of a periodontal pocket even if it could not be probed is the reason for the failure. In the present case, bone loss at the buccal aspect of the root and separation of root apical part can be considered as the causes of unsuccessful nonsurgical attempt for overcoming bleeding. Crown-to-root ratio has been considered as one of the most important factors for long term survival when a tooth with compromising prognosis should be treated. A recent review on crown-to-root ratio from prosthodontic point of view has emphasized that decision on keeping a tooth or removing it should be made case by case. In the present case, despite unfavorable crown-to-root ratio, patient enjoyed normal mobility, pocket depth, and reasonable esthetic up to 3 years after surgery. Absence of traumatic occlusion and immediate splinting following surgery help patient to have successful treatment. Absence of buccal cortical bone has been shown as one of the signs that may occur by a primary endodontic lesion. In the present case, perforating internal resorption can be assumed as the cause of bone loss at the buccal aspect of the root. Therefore, providing bone auto graft during surgery as well as sealing the root canal with MTA and removing apical part of the root may be considered as the reasons for enjoying successful treatment. The importance of short and long time follow-up in teeth with a history of trauma has been emphasized for preventing unfavorable results. , In the present case, patient had a history of trauma 15 years before admitting to the clinic. Inadequate previous treatment and remaining inflamed tissue inside the root canal space could be considered as the cause of perforating internal resorption. The presented case illustrates a successful surgical treatment of a perforating internal resorption that remained asymptomatic for 3 years following treatment. Patient is very satisfied with the results of the treatment keeping her own tooth despite poor prognosis at the early evaluation. 1. Patel S, Ricucci D, Durak C, Tay F. Internal root resorption, a review. J Endod 2010;36:1107-21. 2. Caliskan MK, Turkun M. Prognosis of permanent teeth with internal resorption. A clinical review. Endod Dent Traumatol 1997;13:75-81. 3. Patel S, Dawood A, Wilson R, Horner K, Mannocci F. The detection and management of root resorption lesions using intraoral radiography and cone beam computed tomography: An in vivo investigation. Int Endod J 2009;42:831-8. 4. Parirokh M, Torabinejad M. Mineral trioxide aggregate: A comprehensive literature review-Part III: Clinical applications, drawbacks, and mechanism of action. J Endod 2010;36:400-12. 5. Parirokh M, Torabinejad M. Mineral trioxide aggregate: A comprehensive literature review-Part I: Chemical, physical, and antibacterial properties. J Endod 2010;36:16-27. 6. Asgary S, Parirokh M, Eghbal M, Brink F. Chemical differences between white and grey mineral trioxide aggregate. J Endod 2005;31:101-3. 7. Hsien HC, Cheng YA, Lee YL, Lan WH, Lin CP. 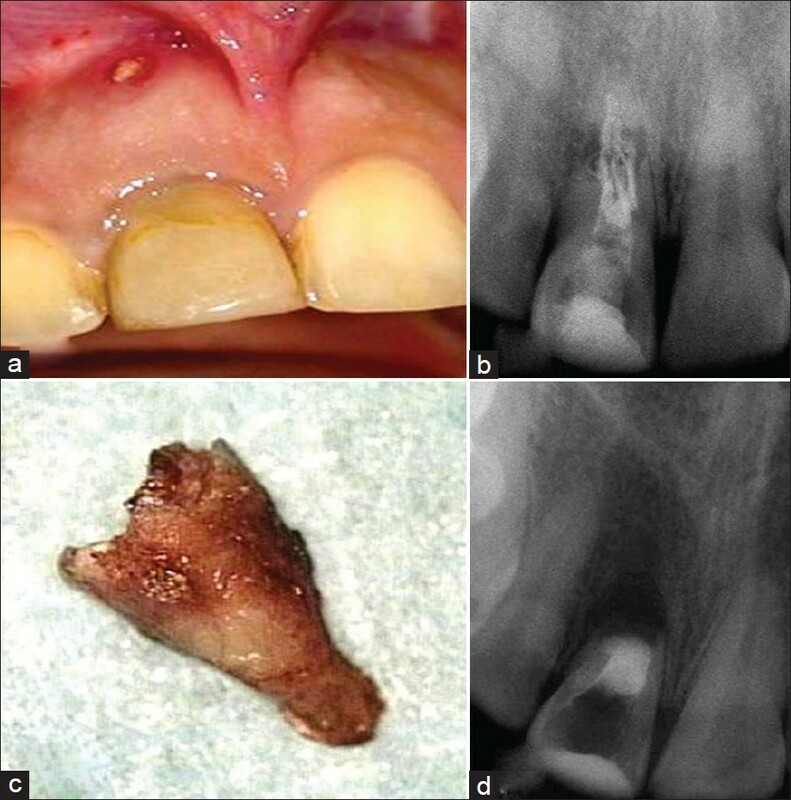 Repair of perforating internal resorption with mineral trioxide aggregate: A case report. J Endod 2003;29:538-9. 8. Main C, Mirzayan N, Shabahang S, Torabinejad M. Repair of root perforations using mineral trioxide aggregate: A long term study. J Endod 2004;30:80-3. 9. Sari S, Sonmez D. Internal resorption treated with mineral trioxide aggregate in a primary molar tooth: 18-months follow-up. J Endod 2006;32:69-71. 10. Meire M, De Moor R. Mineral trioxide aggregate repair of perforating internal resorption in a mandibular molar. J Endod 2008;34:220-3. 11. Altundasar E, Demir B. Management of a perforating internal resorptive defect with mineral trioxide aggregate: A case report. J Endod 2009;35:1441-4. 12. Brito-Júnior M, Quintino AF, Camilo CC, Normanha JA, Faria-e-Silva AL. Nonsurgical endodontic management using MTA for perforative defect of internal root resorption: Report of a long term follow-up. Oral Surg Oral Med Oral Pathol Oral Radiol Endod 2010;110:784-8. 13. Fuss Z, Trope M. Root perforations: Classification and treatment choices based on prognostic factors. Endod Dent Traumatol 1996;12:255-64. 14. Torabinejad M, Parirokh M. Mineral trioxide aggregate: A comprehensive literature review-Part II: Sealing ability and biocompatibility properties. J Endod 2010;36:190-202. 15. Parirokh M, Mirsoltani B, Raoof M, Tabrizchi H, Haghdoost AA. Comparative study of subcutaneous tissue responses to a novel root-end filling material and white and grey mineral trioxide aggregate. Int Endod J 2011;44:283-9. 16. McGuire MK, Nunn ME. Prognosis versus actual outcome. III. The effectiveness of clinical parameters in accurately predicting tooth survival. J Periodontol 1996;67:666-74. 17. Grossmann Y, Sadan A. The prosthodontic concept of crown-to-root ratio: A review of the literature. J Prosthet Dent 2005;93:559-62. 18. Rotstein I, Simon JH. Endodontic-periodontal inter-relationships. In: Ingle JI, Bakland LK, Baumgartner CJ, editors. Endodontics 6. 6 th ed. Ontario: BC Decker; 2008. p. 638-59. 19. Amini P, Parirokh M. The importance of long time follow-up after vital pulp therapy: A case report. Iran Endod J 2008;3:90-2. 20. Keinan D, Heling I, Stabholtz A, Moshonov J. 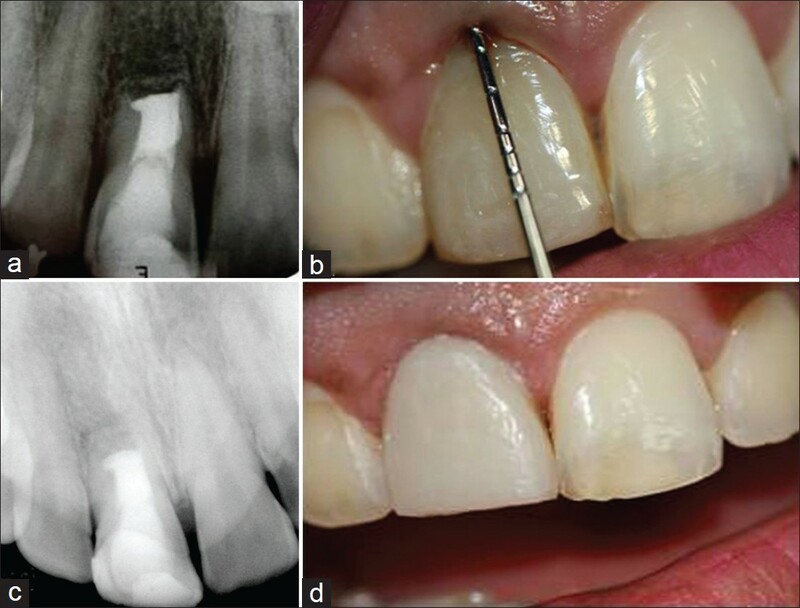 Rapidly progressive internal root resorption: A case report. Dent Traumatol 2008;24:546-9. Kothari, H.J. and Kumar, R.